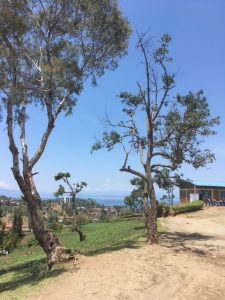 After yesterday’s boat trip in Lake Kivu we went to Niyabidahe School to take 8 local teachers through the CWB Coaching Method, and it was here that we returned on Monday morning for an 8am start to the coaching programme in Karongi. 3 hours, 2 sessions, 200 children and working on a 1 in 10 incline the team absolutely nailed the first school and set us all up for a cracking day. Straight off to Nyegabo School and playing area was even tighter. A bowling and a catching relay station plus a station of ‘Heads, Shoulders, Knees and Cows’ for the Primary children included two of the games taking place on a road! 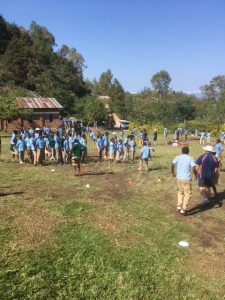 With a session of secondary children too and some significant monitoring and evaluation questionnaires completed, another 200 children had been introduced to cricket, and the team set off for a spot of lunch before the afternoon schools. The luxury of a flat football pitch awaited us at IPRC Technical School and Pete (Lamb) introduced the CWB coaches and teenagers alike to ‘Mayhem Cricket’. It was carnage! Balls flying in all directions. Finishing up with games of rapid fire and five bat cricket we left for the sedate, late afternoon shift at St Marie School. St Marie is a girls boarding school with a nun for a principal. (Every trip I’ve been on involves a nun!). She said there were 400 students and we could ‘have them all’. So much for a sedate late afternoon shift! Playing games on two areas of concrete and a classroom corridor, around 250 (of the 400) girls spent 2 hours honing their skills, and after 10 hours in the field the team had successfully and masterfully completed Day 1. Previous Post Can Cows Swim?